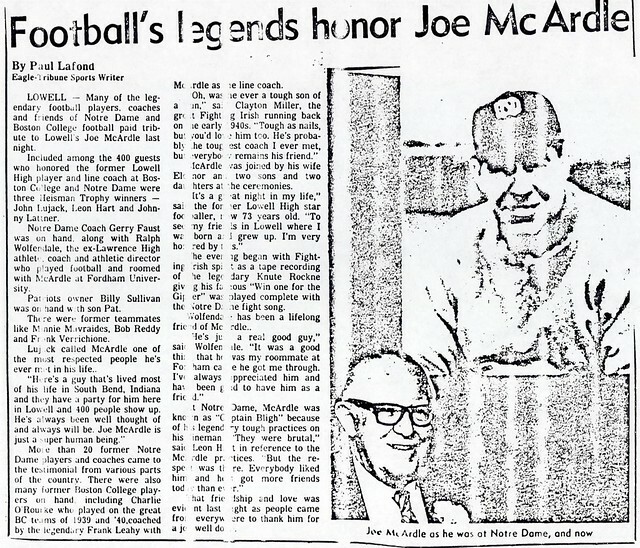 Joseph McArdle’s athletic career stretched from Kirk Street to South Bend, Indiana, and earned him the respect of virtually all he encountered along the way. 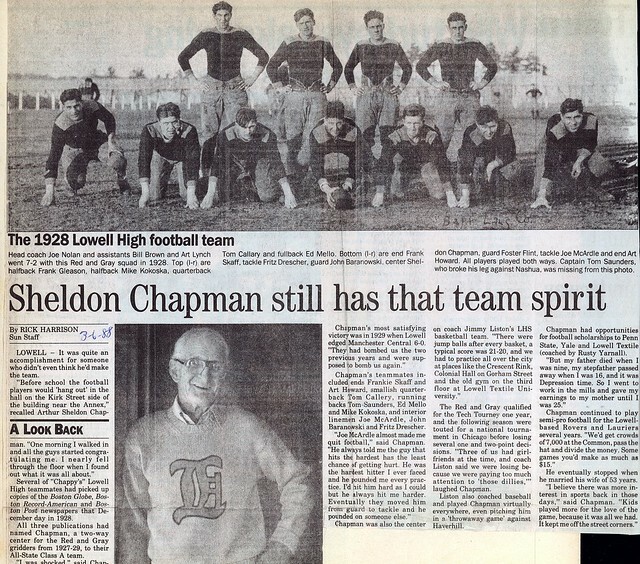 Joe was an outstanding lineman for Lowell High School from 1926- 1928. 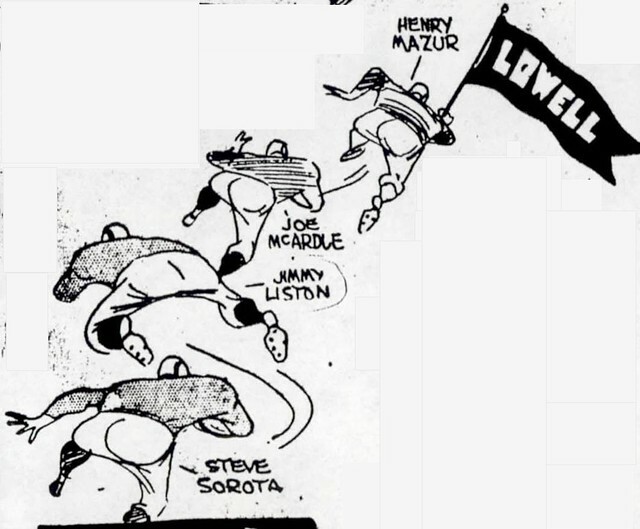 He also was a member of the baseball team during those years. 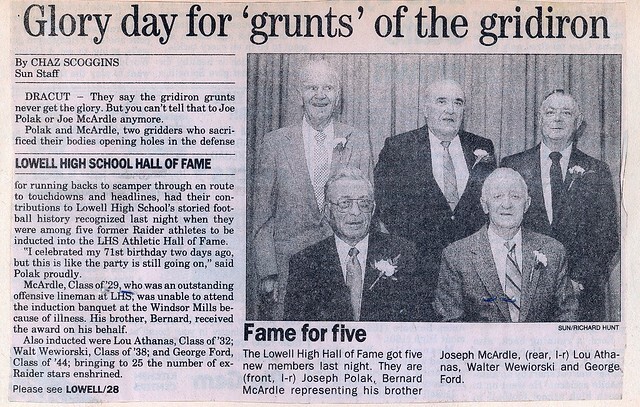 After two years of prep school, Joe enrolled at Fordham University, where he earned three varsity letters as a small but imposing lineman under legendary coaches “Iron Major” Frank Cavanaugh and Frank Leahy. 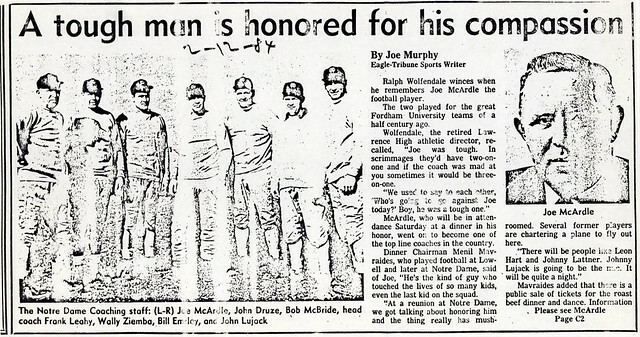 After graduation from Fordham Joe played several years of semi-pro football before joining Frank Leahy at Boston College as line coach. 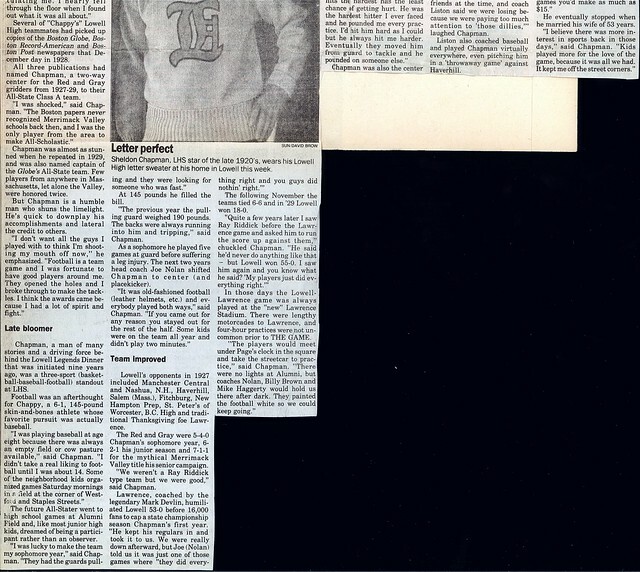 In two short years at B.C. 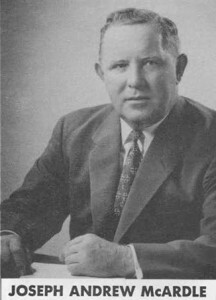 Joe quick gained a reputation as perhaps the top collegiate line coach in the country, as the Eagles compiled a 20–1 record and defeated Tennessee in the Sugar Bowl. 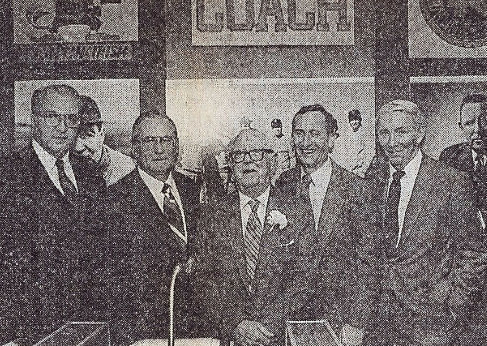 When Leahy took over as Head Coach at Notre Dame in 1941, Joe McArdle accompanied him. 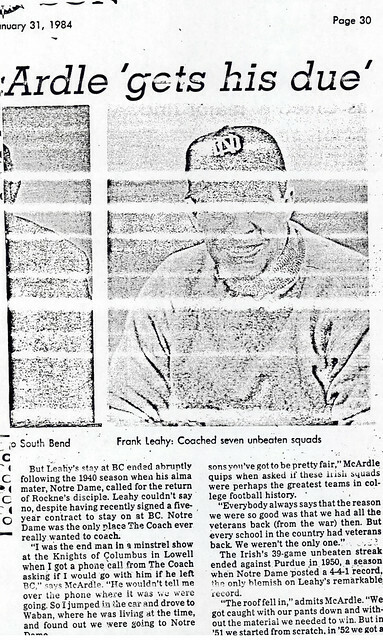 Over the next 13 years, the Fighting Irish won 4 national titles and won 87 games while losing only 12. 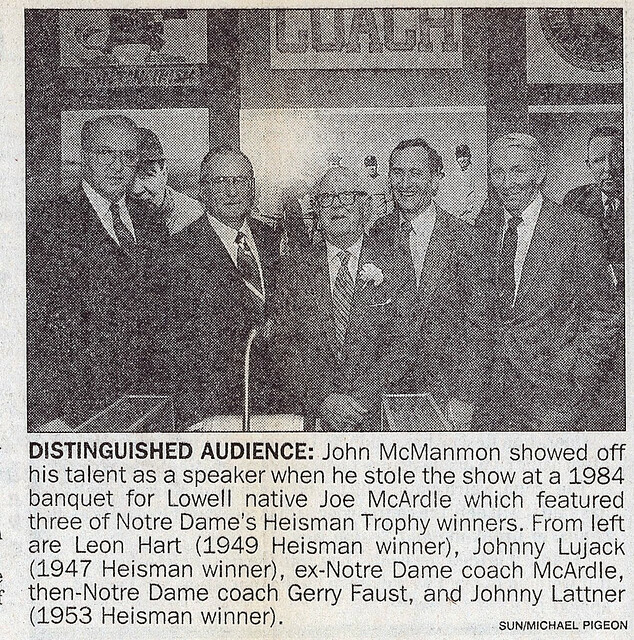 Despite time out for service in the U.S. Navy in World War II, Joe played a significant role in Notre Dame’s success, coaching numerous All-Americans, including 1949 Heisman Trophy winner Leon Hart. 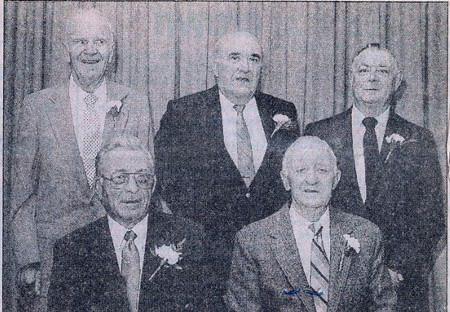 Earning the nickname “Captain Bligh” for his rigid and demanding standards as a coach, Joe McArdle also earned the respect of his athletes due to his concern for them off the field. 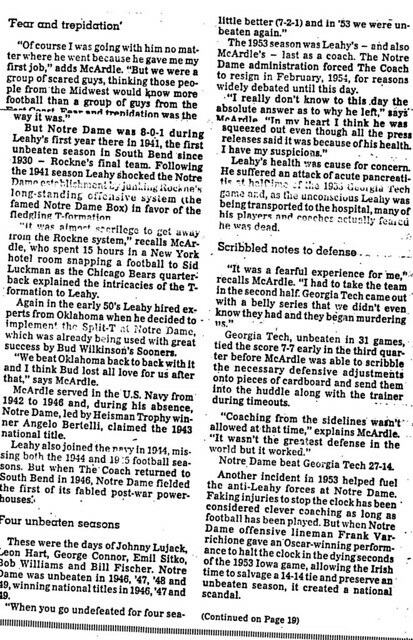 Even today, some 36 years removed from the practice fields of South Bend, he is still thought of as one of Notre Dame’s finest ouches.